Although the practice of giving engagement rings dates back to the fifteenth century, contemporary engagement rings are available in stunningly innovative styles inconceivable to earlier crafters. New techniques in metallurgy, laser etching, and gem cutting make new designs possible, while rediscoveries of ancient methods of jewelry manufacture look as fresh today as they did centuries ago. Modern ring designs suit a more modern lifestyle, speaking more to each couple’s unique relationship than to social standing or convention. Customized rings are more accessible than ever and allow even those on a budget a highly individual expression of their love. Diamonds are a more traditional choice, but modern lapidary techniques take the classic engagement stone into new territory. While a diamond solitaire has a clean-lined look that never goes out of style, consider expressing her individuality with a diamond in a striking new shape. The princess cut is a recent innovation that combines the best of a round cut’s brilliance with the elegant simplicity of a square shape. Princess cuts tend to be a bit more affordable than a diamond of similar weight thanks to the ease with which a diamond’s natural crystalline structure lends itself to the cut. Despite its slightly lower price, princess cuts are dazzling. The rectilinear shape is an elegant choice with contemporary settings. Another radiant cut is the Asscher, a square with the corners cut off. Asscher cut diamonds are a variety of step cut, similar to emerald-cut diamonds in their clean-lined forms, but with much more sparkle than the classic emerald cut. This shape is more expensive than other cuts because of the precision required to create it, but it has a look like no other style and must be seen in person to be appreciated fully. They are a striking option for brides-to-be with refined, but unusual taste. Heart-shaped diamonds are a sweetly romantic choice. Heart-shaped stones require quality diamonds to cut to perfection and may be a costlier cut than others. However, because of the innate quality of the stone used to make heart-shaped diamonds, they tend to be lustrous and full of fire. Classic diamond forms like round brilliant, oval, or teardrop shapes now share the spotlight with novel cuts, but regardless of the diamond’s shape, the “four ‘C’s” of diamond selection–cut, clarity, color, and carat weight–still determine a diamond’s price. The larger, clearer, whiter, and more brilliant the diamond, the more expensive it will be. Diamonds are not always colorless, and colored diamonds (also called “fancy” diamonds) can be a way to express a highly individual declaration of love while still keeping to the tradition of giving a diamond engagement ring. Pink, canary, champagne, and blue diamonds are all striking possibilities. Colored diamonds are considerably more expensive than colorless ones, especially if the color is rich and true. Expect to pay an average of one to two thousand dollars more per carat for colored diamonds than for colorless ones of similar quality. Diamonds are far from the only colored stones fit for engagement bands, however. Other precious and semi-precious gems are becoming increasingly popular in engagement rings. One caveat to consider, though, is the long-term suitability of the stone; a ring meant to be worn for a lifetime should bear a gem that will last. If her favorite color is green, consider using peridot or green sapphire rather than delicate emeralds. Pearls and opals are similarly fragile. Although beautiful, such gems may not withstand a lifetime of wear. Rubies and sapphires are almost as durable as diamonds. They’re unconventional gems for engagement rings, but offer a wealth of color that even fancy diamonds cannot provide. Both rubies and sapphires are a mineral called corundum; true red corundum is ruby and any other color is considered a type of sapphire. Blue is the color most associated with sapphire, but pink, yellow, green, or colorless sapphires also make lovely engagement rings. Prices vary widely depending on the clarity and color of the sapphire. Blue sapphires tend to be the most sought-after, but other uncommon colors can also command a high price. The rare padparadscha sapphire, named after the pinkish-orange sunset hues of a lotus flower, can be as expensive as a diamond. However, its beauty is like no other gem. Modern metallurgy and gem-setting techniques allow mountings that would have been impossible only decades ago. The most contemporary styles highlight the beauty of the gems set within them rather than a jeweler’s artifice. Tension mountings are one of the most striking innovations in modern jewelry. Rather than simply affix a stone to a ring, the entire ring becomes a spring-loaded setting that holds a stone in place, leaving the gem apparently suspended in open space. Tension settings require both high-quality, strong stones and precise craftsmanship; expect to pay a premium of one to two thousand dollars above a conventional setting’s cost for a tension set ring. Only diamonds, rubies, and sapphires with no internal flaws can tolerate the high pressures of a tension setting. Bezel settings are an older technique that has recently become fresh again thanks to new ideas in ring design. In a bezel set, a stone is wrapped completely by metal, giving it a streamlined, contemporary look. Because they conceal any small inclusions along the perimeter of a stone, bezel mounts may be an economical option as the stone within the bezel does not have to be flawless to look brilliant. Bezel settings also have the advantage of offering additional protection to a gem’s thinner edges, making it a good choice both for sturdy diamonds or corundum stones and for more fragile gems. A low profile makes bezel settings easy to wear. Another elegant contemporary setting is the channel mount. Smaller stones fill a channel in the ring’s metal to give an unbroken row of gems. This minimalist look is especially popular when used as an accent for a larger central gem. It can also be combined with other more traditional settings to modernize a classic look. One example is the bridge setting in which a series of channel-set stones cross beneath a taller tension-set or pronged mounting. A hallmark of modern settings is their relative lack of embellishment. Far from being plain, though, a contemporary setting emphasizes the natural beauty of the materials. Contemporary settings also fit well with contemporary lifestyles thanks to their lower profiles and low-maintenance wear. Gold and platinum are excellent traditional choices for engagement rings, but are far from the only possibilities. Metals that were unheard of in fine jewelry applications are now making their way into jewelry stores. The gray gleam of titanium has become steadily more popular throughout the past decade. Its duskier hue sets it apart from white gold or platinum. Titanium’s durability is both a practical consideration for an active bride-to-be and a statement about the strength of the giver’s love. The metal’s strength limits its workability, though, and titanium rings must have pronged settings riveted to the ring rather than soldered. Not all gold is yellow. New techniques in metallurgy have spawned many hues of gold including rose, green, and an array of soft whites. Regardless of its tint, these golds are all equally strong and suitable for jewelry meant to last a lifetime. A stone set in rose gold has a romantic look that’s subtly different from traditional rings, while green or barely tinted white gold can make an unusual stone shine. Using multiple metals is another way in which couples are setting themselves apart from the crowd. Not only is the melding of two or more metals into one perfect circle symbolically meaningful, but the final product is also practical. A ring that combines multiple metals can be worn with any type of jewelry. A Japanese technique originally used to craft samurai swords, mokume gane literally means “wood grain.” The characteristic pattern of whorls and curves comes from using multiple metals to achieve a stunning rippled effect. Although the method is centuries old, the look is strikingly modern. Mokume gane engagement rings may be difficult to find at brick and mortar jewelry retailers, but online retailers such as James Binnion Metal Arts specialize in the technique. Deborah Olague is a close friend of mine who has designed Mokume rings since 2003. She made our wedding bands & she also sells them to many other jewelry retailers who then add significant mark up for people who do not purchase direct from her. Mixed-metal rings are becoming increasingly popular both for their innate beauty and for the symbolism they hold for blended families. As each one is unique, mixed-metal engagement rings make a highly personal statement. A novel choice for an engagement ring gem is moissanite, a diamond-like synthetic stone that has similar fire, hardness, and brilliance to natural diamond. Moissanite is an excellent choice for a bride who admires the look of diamonds, but wants a ring that symbolizes her commitment both to her relationship and to social and environmental causes. Engraving that was once demanding for jewelers to produce is now relatively easy thanks to laser engraving. Many couples now personalize their rings not only with initials or a short phrase written within the ring, but with text on the exterior of the ring’s band. Laser etching allows jewelers to use unusual fonts as both a decorative and meaningful element on a suitable engagement ring. 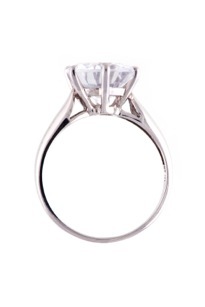 The major trend in engagement rings is toward an overall elegant simplicity. A ring that emphasizes one aspect–a dramatic center stone, a beautiful mixed-metal band, elegant script–over other decorative elements looks newest. Clean lines and organic or geometric forms are replacing the visible architecture of prongs and filigree. Even a minimalist ring design can contain a wealth of symbolism. Central stones associated with the month in which the couple first met are both sentimental and economical. 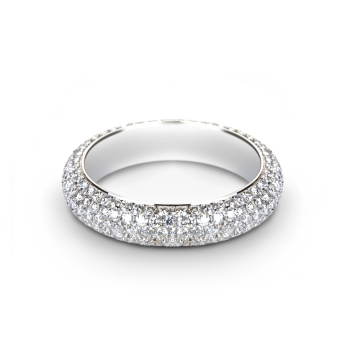 The number of gems on the ring may correspond with the months or years that the relationship has lasted. The “two months’ salary” rule is less an imperative than a suggestion. As couples look at other metals or gems to craft unique expressions of love, the premium price of diamonds and gold have become less of a factor. Contemporary designs focus more on meaning than on cost.